Pop rock is a huge umbrella. Elton John, Something Corporate, Kelly Clarkson, Fall Out Boy, and Jason Mraz all play pop rock. It’s pop music (melody-driven music with catchy hooks that prominently features vocals and follows expectable structures) with rock instrumentation (a lead guitarist/keyboardist and his sidekick rhythm guitarist/keyboardist riding over a bass guitar under the direction of a drummer). Pop rock is a perfectly good term that, while it truly isn’t the largest branch of music, encompasses a vast share of today’s radio playlists. By contrast, terms such as “alternative”, “emo”, and “indie” have been applied willy-nilly to anyone and everyone and thus stretched beyond utility. Jupiter Sunrise plays pop rock. I gave the explanation above so that you could understand two things from such a simple classification — because a good description of any band will include labeling them with one or several genres, and it’s important to know what to do with that information. When I say Jupiter Sunrise plays pop rock, you should first recognize that they will probably sound “just like Band X” to you. They have elements in common with every other pop rock band. Odds are they’ve got 90% in common with at least one other band, if not bunches. But this band’s name is Jupiter Sunrise, and copyright lawyers tell me that proves that this band is unique. So the second thing to realize is that they don’t play the same songs as Band X. Their songs might fit perfectly on an album by Band X and vice versa. But the bands have different members and different songs. Even having 90% in common means being 10% unique. Without question, the most important lesson ever driven through my head was that people use music differently. Some people use music for energy while they jog, some people need a beat to bump ‘n grind to, and I study best when I’ve got the post-metal stylings of Pelican keeping me company. In conversation, these preferences of use are often expressed as judgments of quality. Someone who never plays sports might say that Remember the Name by Fort Minor is “a bad song.” A teenage sophomore who drives her father’s mustang to high school in Orange County might say that “country is crap.” This is a misrepresentation below the level of consciousness. The truth is that the way someone uses music guides the parts of music they pay attention to. Hip-hop does not stereotypically focus on building original melodies out of notes. (Not to say that it doesn’t happen; but notice that one common recourse is the use of sampled melodies to complement original content.) What if you like adding your voice to soaring soprano choruses on long road trips, not bobbing your body to the rhythm of a spoken beat? Dismissing the genre as something short of real music is naive at best. Recognizing that the strength of the genre lies in elements you instinctively ignore gives you insight into why anybody ever tunes in to that station. So if the 10% that is unique about Jupiter Sunrise is the 10% that you are most aware of as you listen – because it is the 10% most relevant to a way in which you use music – then you will find them much more unique. If your personal focus lies elsewhere, then they might sound to you 100% like Band X, because the differences are not of a kind that naturally registers with you as you listen. This same rule applies, of course, to whichever friend of yours (or whichever professional critic) is describing the band to you. This is the most crucial bias of which you must be aware, both in the speaker and in yourself. This puts things into perspective and explains how all of a band’s fans can seem so stupid and wrong when you hear the music for yourself. It is the purpose of a review, or casual explanation, to draw up comparisons and contrasts and thus examine the whole of a band. But the most interesting part tends to be that unique 10%, so a lot of words are spent identifying something that a large number of people will autonomously overlook. That is today’s lesson. Now, quickly, I present: Jupiter Sunrise – Under a Killer Blue Sky (or Heavy Things). I went up to John St. Park and there I met an old lady feeding ducks. The back of her hand had been bleeding and she didn’t even know it. She told me I’d be more handsome if I smiled. So we talked about the weather, she told me about her family and she said I should meet her granddaughter, and I smiled. We’re wondering what you’re thinking, Arthur Nix. ‘Cause ever since you rode your bike into that car and were quickly whisked away by ambulance, you’ve been so pensive and quiet. Did your arm heal faster than your heart did, Arthur? Each has his own distinct, but pop-rock-certified, vocal style. Jupiter Sunrise’s forte is in giving each verse and chorus a different feel through instrumentation and arrangement while the vocals show little variance within each song. Typically, not just the volume but the rhythm, style, or number of instruments playing will be dynamic during a verse, and the next verse will be a novel variation on the same organic idea. There’s plenty of instrumental play in intros and interludes as well. Oh, and it’s worth noting that this is a guitar band – keyboards make a minor appearance on each of two tracks and are otherwise absent. 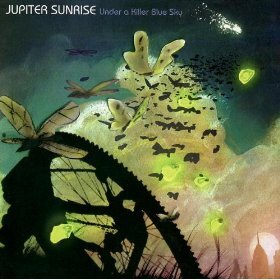 Jupiter Sunrise laid low for years after UKBS, their only true album to date. Recently they’ve popped up for a few live shows. A Twitter acount christened in April 2009 and occasional new songs on their myspace stand as signs of new progress. However, the lineup listed on their website has two different categories for “current members” and “members who played on Under a Killer Blue Sky.” So it’s possible that they are an entirely different band now than they were five years ago when UKBS was made. Who knows, maybe they’ll sound the same. Their currently defunct website once told me that all four band members were vegan, so maybe change is good. No way! I love Jupiter Sunrise (found them out/met them at warped tour 05…man that was a long time ago), and I thought they’d disbanded! As far as I knew Ben Karis was doing his own thing now and has some independent projects going, but if they ever get back together I’ll be thrilled. The new songs posted on MySpace definitely sound like Mark Houlihan on the mic. Their main webpage used to have songs streaming that they recorded more recently than UKBS – if some of those got published, I’d be all over a new disc.